Just How Are Bats Beneficial? We may not like bats in our house, but we surely do like the ways they benefit us. Bats are amazing creatures. They are the only flying mammal, and, with almost 1000 living bat species, account for nearly one-quarter of all mammal species. The smallest is the bumble bee bat with a wingspan of 6 inches and a weight of less than an ounce. The largest bat is the ‘flying fox’ in Asia with a wingspan of up to 6 feet and a weight of 2 pounds. Most bats roost (rest and sleep) hanging upside down by their hind feet that automatically lock them into position. Some bats hibernate, and some migrate. Bats can use their legs to walk, but cannot jump up and take off in flight from the ground; they must drop from a reasonable height to get started. Bats give birth to live young, usually just one. Some caves may be home to millions of bats, yet when the parents return with supper, they can immediately find their own young. Bats have a hair coat with whiskers and even lose their baby teeth as they grow. Its lifespan ranges between 10 and 32 years, depending on the species. Bats get a bad reputation because of vampire movies. Actually only the vampire bat likes blood. Most of the others chow down on insects and lots of them. One bat can eat from 600 to 1,000 mosquito-sized insects in only one hour. A typical colony of 150 big brown bats can eat 33 million rootworms each summer. This really helps farmers! A long eared bat called the pallid bat can hear the walking insects like the grasshopper, scorpions, and centipedes and keep their population under control. Bats also help in pollinating, fertilizing, spreading seeds, and even in making certain drugs. Bats are so beneficial that, in some states it is against the law to exterminate them. We have all heard the expression ‘blind as a bat’ but this is a misnomer. Bats are not blind and some bats see quite well. But insect eating bats do not rely on their eyes to locate prey. (After all, they are nocturnal.) For navigation and to find their food, they send out a sound and ‘listen’ for the echo. This is known as echolocation and is similar to radar. The bat produces a sound through its mouth that pulses at 50-60 times a second. The frequency is 30,000Hz or more, well beyond the human range of 20Hz to 20,000Hz. When the sound, traveling at 760mph, bounces off of an object, the bat is able to determine the nature, size, and location of the object by the return sounds that enter its large ears. 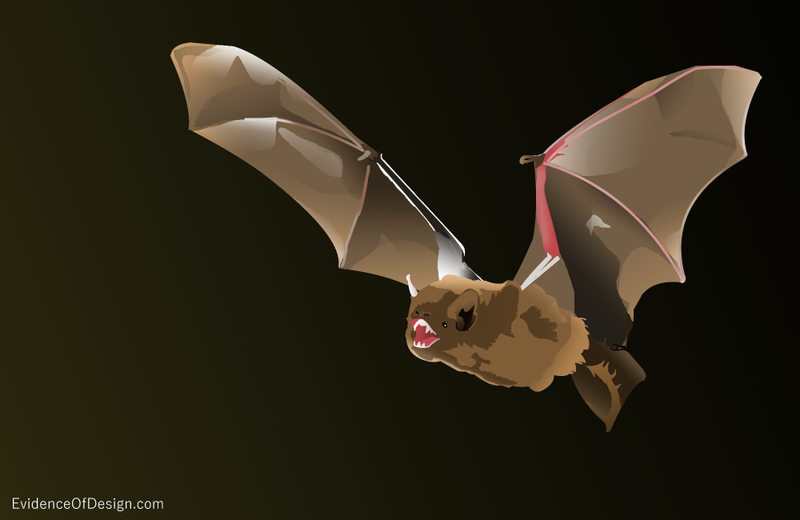 By continuing to emit this sound, the bat nimbly zeros in on an insect and devours it. Modern radar systems were invented after studying echolocation such as that of the bat. Yet, no one would claim a radar system happened by accident. How much more ridiculous it is to claim this for the prototype!